The other night I was looking for some new bell pepper recipes, as we had a lot of those that needed to be used up. 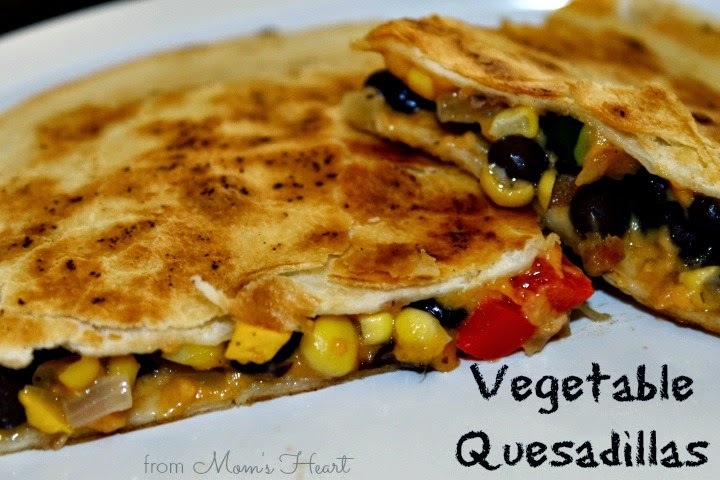 I came across this Farmer's Market Vegetarian Quesadillas and I don't know why quesadillas hadn't crossed my mind, but I knew this was going to be my inspiration for dinner the next night. I was even more thrilled to find this specific recipe because it was veggie based and it included squash and zucchini which are always in excess supply at our house during the summer thanks to my generous in-laws and their garden! I'm always looking for new ways to use those up, so I figured I'd give it a try! I did alter the recipe that was my inspiration. I had to substitute, omit and add, based on what I had on hand and personal preferences, but I still think it's a great base recipe. I substituted yellow onion for red. I omitted the mushrooms because we didn't have any, and I despise the texture of mushrooms anyway. I added some yellow bell pepper to the red, mostly because of the multitude of bell peppers that we had. My 7 year old prefers his bell peppers raw, so this way I had some some leftover for him too. I added black beans and corn because it sounded good. I also seasoned the vegetables, as the original recipe didn't call for anything. I had to use regular flour tortillas because we didn't have wheat, but they were open in the fridge and needed to be used, which is another reason this recipe was timely! In a large skillet, over medium heat, I added the bell peppers, zucchini, squash, onion, garlic and salt/pepper. I cooked just until tender, about 7 minutes maybe. Love the colors! I had cooked the corn on cob while I was chopping veggies, so while the veggies were cooking, I cut the corn off two small ears, and I shredded the cheese. I stirred in the black beans and corn at the very end of the cooking time for the veggies, just to warm them. Then I transferred the veggies back to the bowl I was using as I chopped. Confession: this veggie mixture was actually really good just like this! I assembled them following the instructions of the original recipe--spray pan with cooking spray, 1/4 cup cheese, 3/4 cup veggies, 1/8 cup of cheese. Top it with another tortilla and allow to cook about 2-3 minutes on each side. It actually flipped easily enough, but the tortillas didn't "stick" together as well as I'd hoped, and the veggies leaked out a little. My husband informed this novice cook that I should have just put another heavy skillet on top and it would have held together better. Lesson learned. Then I sliced into quarters and it was oh so yummy! 1. Oil the skillet, and cook the bell pepper, squash, zucchini, and onion, with minced garlic, salt and pepper, just until tender. 2. Add black beans and corn to warm through, then remove veggies from heat. 3. Spray skillet, still on medium heat, with cooking spray. Place one tortilla in skillet, and layer with approximately 1/4 cup cheese, 3/4 cup veggies, 1/8 cup of cheese. Top with second tortilla, and cook on each side (2-3) minutes until brown and crispy. 4. Repeat for remaining ingredients. 5. Serve warm with sour cream or any other favorite toppings! I ate mine with sour cream, but I'm sure it would work with guacamole or salsa. This was one of those times I cooked a "me" meal, as I cooked this on a night the husband was out of town for business. The first thing he said when I mentioned vegetable quesadillas was "Oh, that would be so good with mushrooms in it!" so if I make them again, I'll just add mushrooms to his. He said he wasn't sure if he'd like it with squash/zucchini, but I didn't think you could even taste them. I find those to be rather tasteless though, so I'm not sure if it was just me or not. The recipe made 3 quesadillas (so leftovers for the next day since I was the only one who ate them) with a little veggie mix leftover. The boys weren't a fan, so they mostly ate corn on the cob, bell pepper slices, and some other fruits and veggies. Eleanor liked the actual quesadillas, but when I tried to serve her some of the veggie mix, she had a rare "no thanks" moment. I really liked these, and they were actually fairly quick to prepare. I like that it's a different way to use all the garden vegetables we get during the summer. This recipe is linked to Try a New Recipe Tuesday. This looks absolutely deelish! Did you grow this ALL in your garden?? Ha NO! I don't mind to snap beans or help with the "easy" stuff, but I don't actually garden. We live next to my in-laws, who generously share their goodies every summer. The boys did start a few plants indoors this year and transferred them to their grandparents garden, but that's the closest I can get to keeping a plant alive long-term!